Forget raindrops on roses and whiskers on kittens. I’ve got soy sauce on tomatoes and honey butter on zucchini cornbread. Oh. Yum. This week’s Shabbat line-up featured some real winners: food and people and circumstances that never fail to make me smile. Here they are, in no particular order. 1. Small meals. We’re talking 6 people or fewer, about the speed I can handle right now. The kind that don’t require bringing up extra chairs from the basement or making sure the house is entirely clean. Because it isn’t. And might never be again. 2. Curried butternut squash soup. This soup is perfect. It’s easy to make. It’s good hot or cold (Friday night, we served it cold). It’s Marc’s favorite food. He grinds his own curry powder to use in it, but any kind of curry powder will work, and it will still be delicious. This time, we also put swirls of sriracha on top. 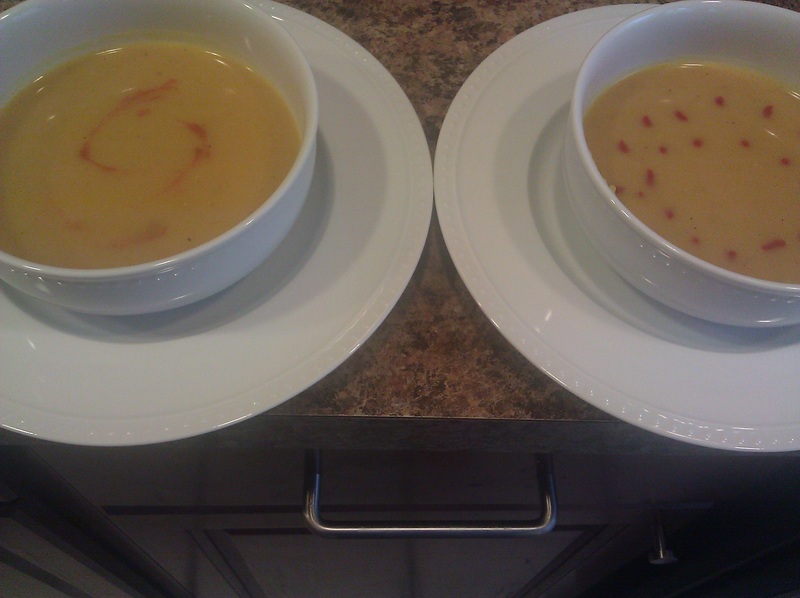 And my picture of the soup contains another favorite we’ll call 2a: Finding faces in unexpected places. Melt the butter in a saucepan. Add shallots, garlic, and curry. Cook for 3 minutes, stirring constantly. Add the squash and combine well. Cover and cook over low heat, stirring occasionally, until the onion is tender, about 15 minutes. Add the broth. Cover and simmer for 30 minutes, until the squash is tender. Blend until smooth. Season with salt and pepper (and I recommend sriracha!). 3. Cooking with zucchini. I actually hate zucchini. 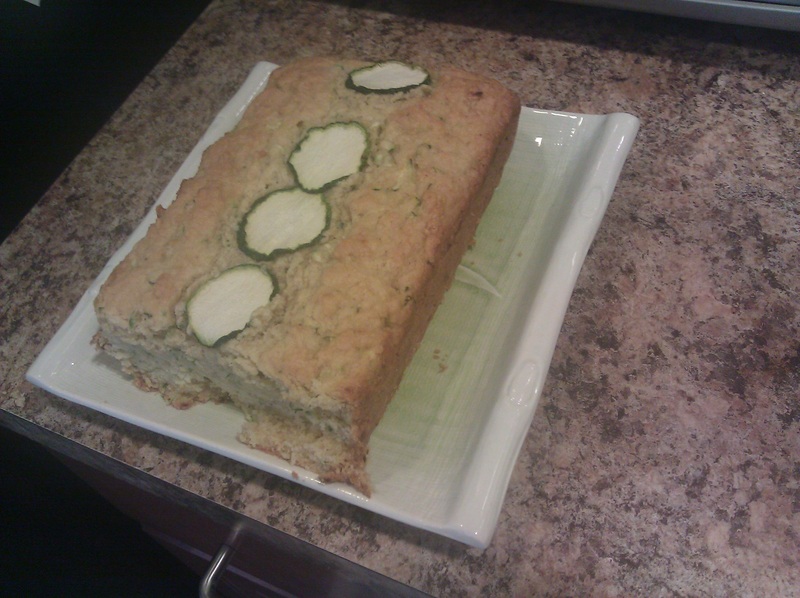 It’s like an uglier, duller cucumber wanna-be. But putting it in baked goods makes me happy 1) because I feel like I’m outsmarting the zucchini, 2) it feels uber-resourceful, 3) it reminds me of zucchini brownies at Yom Kippur break fasts in my childhood that always made me feel cheated when I found out there was a vegetable in them, but in retrospect make me nostalgic. This week I made zucchini cornbread, straight out of this month’s Bon Appetit magazine, but I used egg replacer instead of the eggs, and it turned out fabulously, except for one thing: the recipe calls for using sliced zucchini on top of the bread as garnish, but the bread didn’t cook well directly under the slices and they just got soggy and weird. Definitely make this recipe, but leave that part out. Marc made honey butter to go on top, which it turns out is also a nice popcorn topping. Also, in case you have enough zucchini lying around for two baked goods, I recommend Barbara Kingsolver’s recipe for zucchini chocolate chip cookies, which I look forward to making soon. Here’s the bread, pre-dinner. And yes, there’s a slice missing. 4. Tomatoes in soy sauce. I got this combo from one of my all-time favorite articles, “101 Simple Salads.” This inspiring list of yummy things was in the New York Times two years ago, and I still refer to it quite frequently. 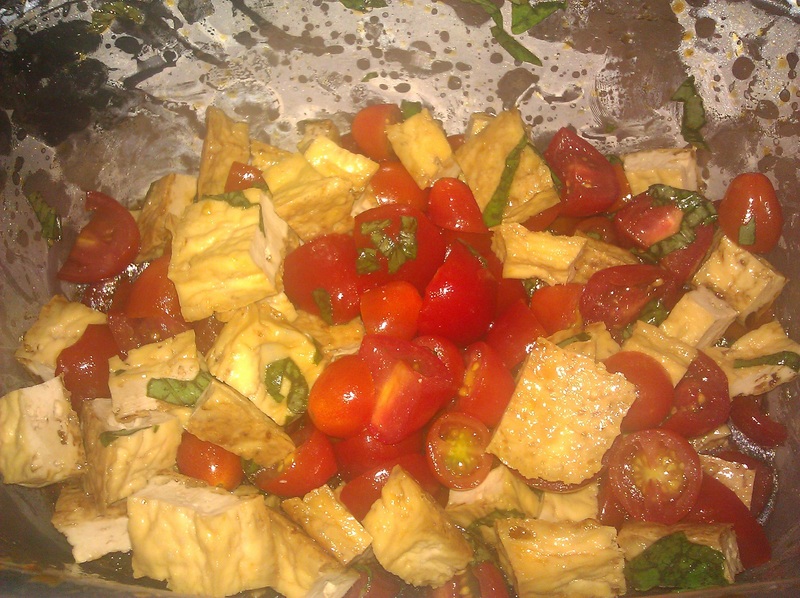 Halve grape tomatoes, thinly slice fresh basil, toss with soy sauce and sesame oil. Add baked tofu to make it more meal-like. 5. Finding something new in Entertaining for a Veggie Planet. I know I talk about this cookbook all the time, but this week I made green skordalia, a recipe for Greek potato dip that I’ve never made before. Since I approximated, here’s the approximate recipe: Peel and boil white potatoes until soft. I think I used 5 small-ish ones. Drain and mash, then add olive oil, salt, garlic, thinly sliced fresh basil, chopped scallions, lemon juice, and black pepper. It’s supposed to be a dip, but I think this might become my new mashed potato formula. 6. Shabbat naps. Any naps. All naps. Any time of day. 7. Chickpea salad. I can’t get enough of this. If you’ve ever eaten at my house, you’ve probably had it. Recipe from Olive Trees and Honey. In a large bowl, combine the chickpeas and onion. In another bowl, mash garlic and salt together. Combine with lemon juice, parsley, and other spices. Whisk in the oil. Pour the dressing over the chickpeas and toss to coat. Cover and refrigerate for at least 1 hour or up to three days. 8. Torah study. Ok, this is not actually usually one of my favorite things. But Torah with Tikvah met this week, and it was really lovely to sit down with people in an unhurried space with no agenda and just discuss. 9. Not working. Friday night, there was a Grad Network Shabbat dinner, and I wasn’t there. Yes, it’s nice to be on leave. Really nice. But more than that, it’s also so reassuring to know that the Grad Network community is thriving without me. 9. Shabbat walks. Post-nap, it had cooled off enough outside that I had to get moving. On our way to Beverly’s, we ran into Sara and Beverly, who were on their way to find us, so it was clearly beshert, meant to be. 10. Nutella ice cream. Marc made two batches, just to compare. Lucky me. 11. I heart New York. I’ve now lived outside New York State for almost as long as I lived in it, but with the passage of marriage equality over Shabbat, I’m happy to reclaim my New York heritage. Hooray!! 12. Making lists. This is a meta-favorite, it’s true. But now that I’m back in the Shabbat hosting game, however small-scale, it’s good to have the opportunity to list our menus on the white board again. The birth of a Jewish baby girl is one of those occasions where the lack of prescribed ritual provides the opportunity for a lot of flexibility. Some parents name her at the Torah on a convenient Shabbat after the birth, some hold a naming ceremony on the 8th day of a girl’s life since that’s when a boy’s brit milah (circumcision) takes place, and some invent their own creative rituals. As for me, having done a lot of research in college on all the different possibilities and historical sources of welcoming rituals for baby girls, I obsessed for quite a while about the most authentic ritual for our new family and finally figured that when the time came, the right celebration would emerge. The day Aliza was born, Marc and I, with all four of Aliza’s grandparents in the hospital room with us, read a blessing that we found on Ritual Well (shout out to a great website), and named her in a non-traditional, private, and perfect way. 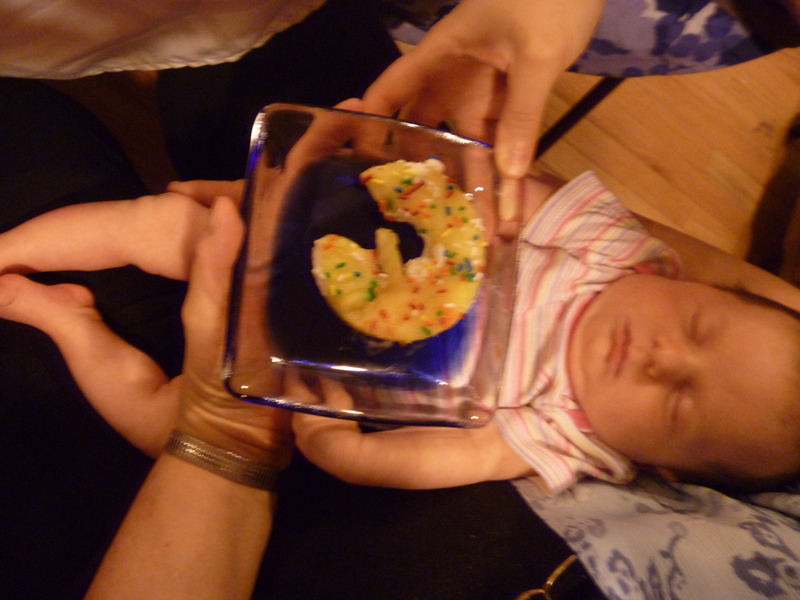 We named her and welcomed her into our family when she was born, and this Shabbat was Aliza’s Simchat Bat (translated as welcoming the daughter), which was an opportunity to welcome her officially into the broader community and specifically to our Jewish community. Friday night, we had Shabbat dinner at our place with our parents and my aunt Janet (one of my blog’s most ardent supporters! ), and it was one of my favorite Shabbat dinners on record. 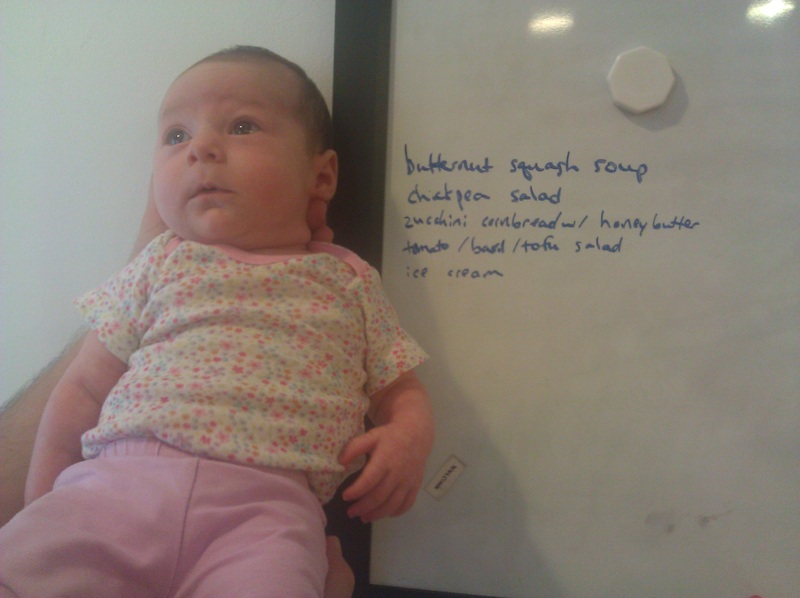 With so many people clamoring to hold the baby, I got to use both hands to cook, and though I made a simple meal, it was fulfilling to cook for other people and exercise a little of my entertaining itch. We had baked ziti (previously published here), garlic bread, and sauteed collards and kale. I typically hate those “about.com” websites, but this recipe fit the bill of being easy, using CSA veggies, and coming up first on a google search. 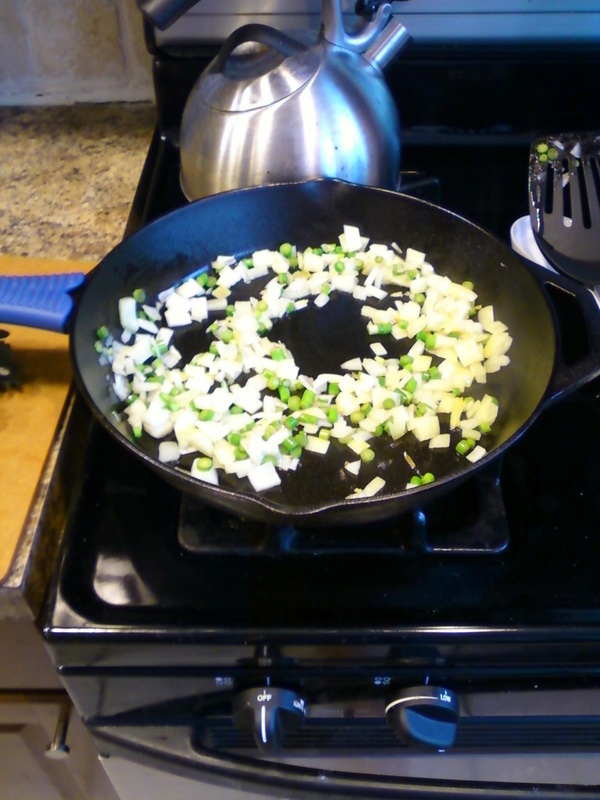 As with most things during the early weeks of CSA season, it started with a saute of onions and garlic scapes. We shared a lot of family stories at dinner, laughed a lot, and generally had a great time. The number one thing I learned is that all of our parents played with mercury as kids. Really. Mercury. My mom and I have talked a lot about how the safety standards for baby products has changed over the years, but actually playing with mercury is in a category all its own (well, along with a few other things that I’ll have to cover in another essay entitled “It’s amazing our parents survived their childhoods”). For dessert, Marc made Pineapple Surprise: Take one fresh pineapple and a super duper fancy pineapple corer, and place the whole spiral of pineapple in a bowl. Surround with whipped cream out of an aerated canister and top with sprinkles and/or chocolate sauce. Enjoy eating and telling your guests “I told you so!” when they’re surprised that it’s delicious. A cute baby helps any food taste better. The Simchat Bat was Saturday at Minyan Tikvah, and it was such an amazingly special experience to welcome Aliza into this community that means so much to us. I got called up to the Torah with Aliza, and Jo said a mi sheberach (blessing for people in special circumstances, including sickness, marriage, participating in services, and having a baby) to welcome Aliza into the community. Looking out at our friends and family while holding this perfect, sleeping baby brought tears to my eyes of the best kind: hope and excitement and such immense gratitude. For lunch, we had bagels and spreads (hooray for shopping at BJ’s! ), and I finally got to make and serve the spinach dip I’ve been craving. My mom made chocolate chip cookie bars and poppyseed cookies, and again, it was a simple but totally fulfilling meal. 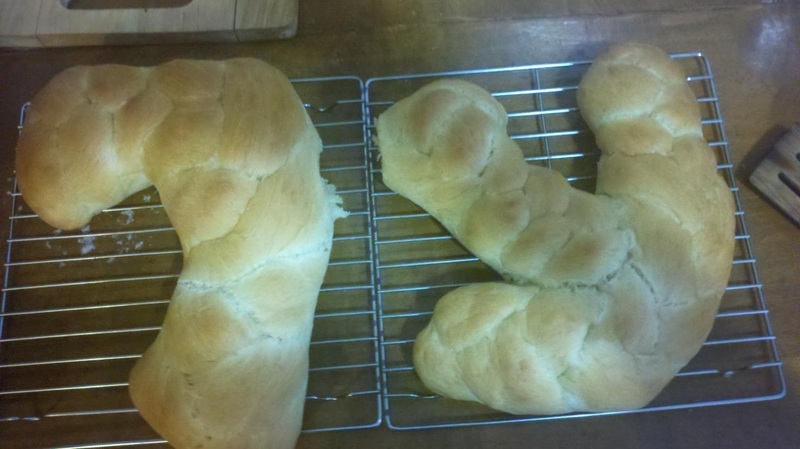 One of the highlights was definitely Beverly’s challah, made in the shape of Aliza’s Hebrew initials! At lunch, I shared with everyone the importance for us of having an egalitarian community in which to raise Aliza. What I forgot to say was that my parents have each mentioned looking forward to her Bat Mitzvah, which, God willing, will be in 2024. We hope and expect that we will all celebrate a lot more simchas (happy occasions) together between now and then. As amazing as it was to receive so many meals from our friends, I have to admit that it’s a relief to be cooking for ourselves again. My ability to feed myself affirms that I’m still an individual able to fend for myself, and that I can still make decisions about what and when to eat that aren’t tied directly to the baby. And with that in mind, we reentered the world of Shabbat entertaining this week, but we did so modestly, and hosted one person for dinner and a small handful for post-dinner hanging out. Ilana got here just as I was starting to make the main course, so I don’t quite have the timing down of cooking with a baby, but it all got done. We had salmon patties for dinner, a dish I grew up with and rediscovered during pregnancy when I was trying to eat more protein. We also had Near East rice out of a box ( Marc and I aptly call it “salty rice”), salad (hooray for the start of CSA season! ), and challah that we just had to take out of the freezer leftover from the last couple weeks of people’s generosity. Also, after about 10 months of not drinking, I poured myself a small, tentative glass of beer, which I didn’t come close to finishing, but it felt great to have it in front of me. 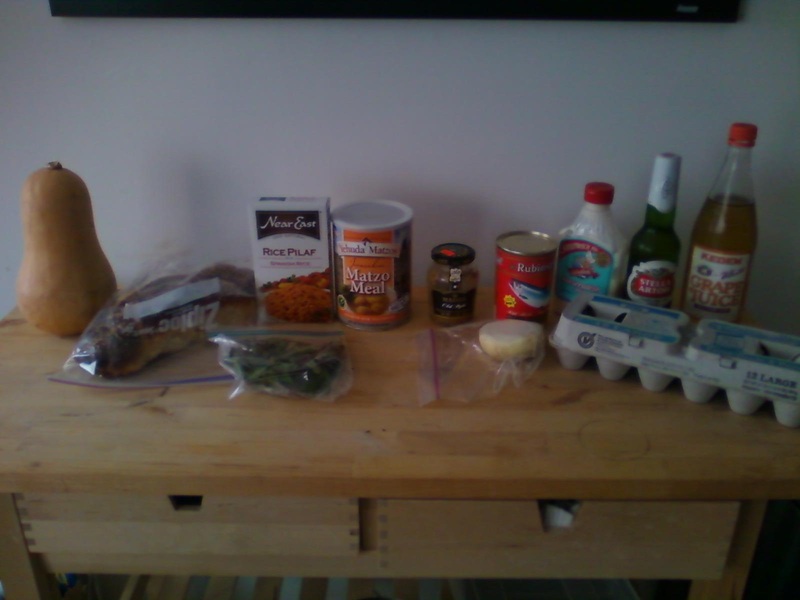 Here’s the pre-cooking spread; dinner didn’t include the butternut squash, but it was just too pretty to move. Also, I didn’t use this can of salmon, since it contained skin and bones and the note, “skin and bones are healthy and edible” (ok, that’s an approximation), and I just couldn’t deal. This is a very forgiving recipe based loosely on my mom’s recipe, which is based loosely on how she actually makes it. So knock yourself out and don’t worry too much about being exact. I don’t. The patties are tasty served with horseradish sauce (as pictured above) or ketchup, and if you want a taste of my childhood, put them on saltines and squeeze the ketchup through the holes in the crackers. Mix everything together and fry in a bit of vegetable oil. Best served immediately. Some other friends came over after dinner, and we had dessert: strawberry ice cream (homemade of course) with Utz Party Mix, Twizzlers, and M+M’s. It all went together quite well. The cheesy-flavored parts of the Utz Mix disappeared first, leaving the pretzels behind. The dwindling cheese puffs reminded me that this was the most popular snack for my 3rd grade students back when I was a teacher. I had to take the utmost care in serving snack on Utz Party Mix days in order to avoid fights over the cheese puffs. But I didn’t have to worry about hard feelings on Friday night, and I’m pretty sure I finished the cheese puffs myself. I had been feeling kind of stir crazy, especially since it was so hot last week, but all the socializing over Shabbat cured me of that. We went to Beverly and Naomi’s for lunch and ate lots of yummy salads, and then we moved on to Josh’s later in the day for snacks, board games, and hanging out. I didn’t have any cheesecake over Shavuot, but Sherri fixed that for me! I’ve also been feeling like this blog has been a little light on the recipes lately, so I’m including the salad I just made for myself, which was inspired by the new Bon Appetit’s article with summer slaw recipes and my CSA veggies, as well as the fact that Aliza was taking a nice nap just when I got hungry. I tried to julienne the veggies to be as classy as Bon Appetit, but cut them however you like. And please, approximate quantities based on what you have and what you actually want to eat! 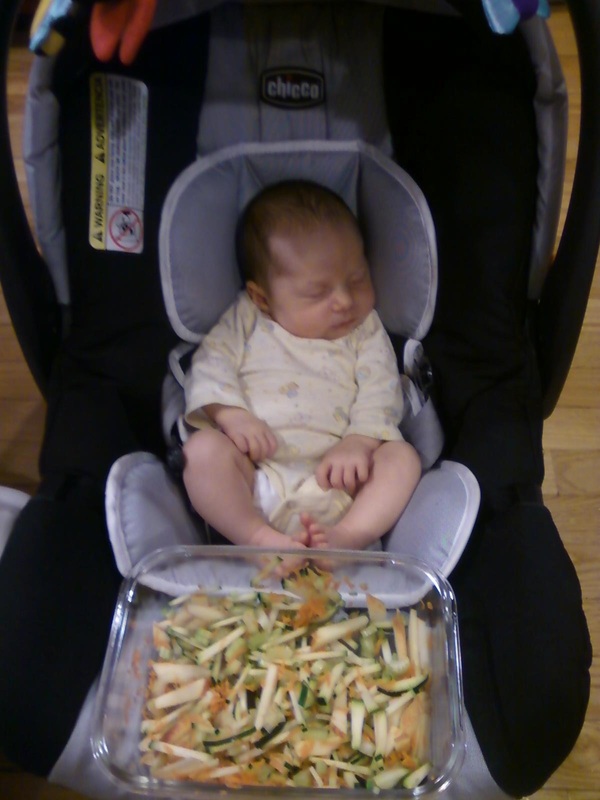 I’ve been getting many requests for more baby pictures, so I posed my sleeping baby with my afternoon snack. After counting the Omer for the past 7 weeks, we made it to Shavuot, which starts tonight at sundown. When Marc and I started counting, the idea was that once we reached 49 days, the baby’s arrival would be imminent. Even with Aliza’s early appearance, we actually managed to count every day, and it really does feel like an accomplishment. Speaking of which, Shavuot is actually a great holiday for new parents, since one of the traditions is to stay up all night. Who knows what tonight might bring, but it’s nice to know that whenever we’re awake, Jews around the world will also be awake. They’ll be studying Torah while we’re more likely to be changing diapers, but now seems like a good time to invoke the idea that, depending on how you spin it, everything is Torah. Today is Tuesday, which already puts us some distance from Shabbat, and with the end of the Omer, I’m afraid it will just keep getting harder to keep track of what day it is. Nonetheless, I do remember Shabbat this week. File that under another accomplishment. Our next door neighbor brought us dinner on Friday: black bean polenta pie and some of the richest, best brownies I’ve ever had. Saturday, we actually ventured out and ate lunch at Beverly and Naomi’s. Everything on the menu was a new recipe, and it was all awesome. The carrot mint soup got mixed reviews, though I think I liked it more than anyone else. The seitan pasta salad was so good that I kept going back for more after dessert. Marc made an experimental dip that turned out incredibly well and is still good as leftovers. The title comes from the fact that we couldn’t decide between making hummus and making a yogurt dip, so we (he) made both, together. You know those word clouds that show all the words that appear in an article, with the words that appear most frequently showing up bigger? 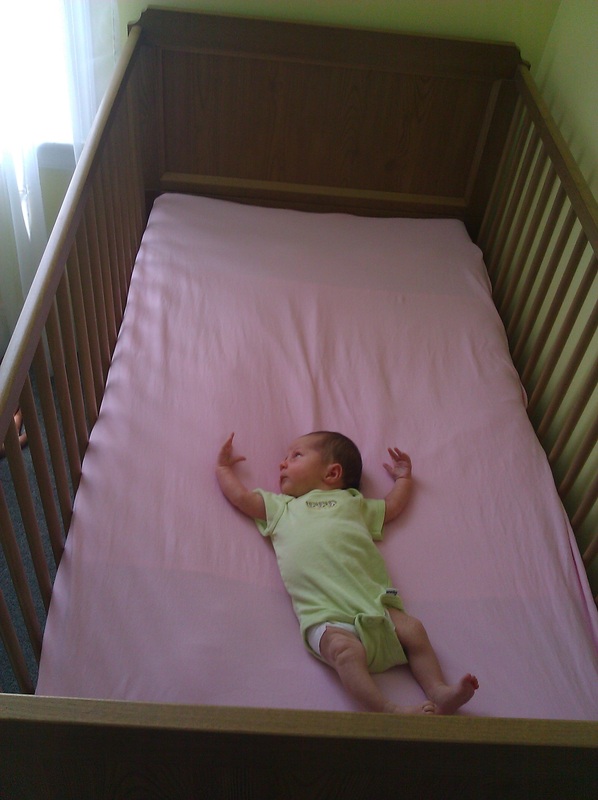 I think “sleep” would be the biggest word in a word cloud of this blog post, so in honor of that, and in honor of our incredible friends who bought and assembled the crib for us, here is a very awake Aliza in her new crib, where, hopefully, she will sleep sometime soon.